Remedial and Surrogate Parenting is excellent monograph providing the reader with clear and concise information on the management and care of abused and neglected children. Dr. Green's approach is comprehensive and the reader will appreciate succinct writing filled with practical ideas and strategies for behaviors the surrogate family may experience. The monograph, although useful in a classroom setting, would be a great read for the couple or individuals considering surrogate parenting or adoption of a child with an abusive/neglected developmental history. The book provides the reader with a realistic examination of what one can expect from a child raised in a compromised environment. Dr. Green does not neglect the fact that although the responsibility and commitment is great, taking a child that has yet to learn how to be loved, to love, and to form healthy relationships can be a highly rewarding and challenging endeavor. Remedial and Surrogate Parenting this book has good suggestions for caregivers and will have a broader audience than just caregivers. There is much that would contribute to the education of the workers who are not directly related to childcare. 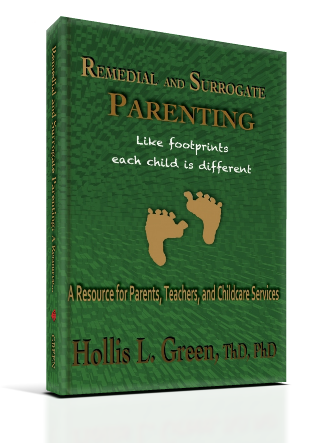 Remedial and Surrogate Parenting the information in this book is priceless and it should be required reading for caregivers, school teachers, parents and anyone who works with children. It is the only book I have encountered that mentions history and how it affects the development of Caribbean children. I think that link is important. I especially like the layout of the book. It is easy to follow.